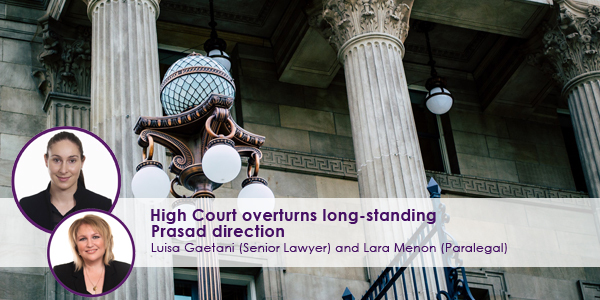 A recent decision in the High Court of Australia has overturned what is known as a Prasad direction, a principle which has been applied in criminal cases since 1972. The principle is named after the case of R v Prasad (1979) 23 SASR 161, a South Australian decision which has been adopted by New South Wales Courts. What is a Prasad direction? In a criminal matter, at the conclusion of the Prosecution’s evidence in chief, the Judge may give a direction to the jury that if they believe that the evidence they have heard is not sufficient to support a conviction, it is open to them to stop the trial and enter a verdict of not guilty. If there is direct evidence which is capable of proving the charge, it is not open to the Judge to give a Prasad direction, regardless of the Judge’s perception of the strength of the evidence. If the Judge chooses to give a Prasad direction, the Judge should tell the jury that it is open to them to bring in a verdict of not guilty at the conclusion of the Prosecution’s evidence or at any time during the trial, however they must be unanimously convinced that the evidence is insufficient. Is a Prasad direction still available? Following the decision of the High Court on 20 March 2019, Prasad directions are no longer available. The unanimous decision in the matter of Director of Public Prosecutions (DPP) Reference No 1 of 2017, Re  HCA 9 held that a Prasad direction is contrary to the law and should not be given to a jury during a criminal trial. The Court held that for a judge to invite a jury to stop a trial without hearing the totality of the evidence and without understanding the application of the law to the facts was not only inconsistent with the division of the roles of judge and jury, it was akin to inviting the jury to decide a matter from a position of ignorance. A jury no longer has a common law right to return a verdict of not guilty at or after the close of the Prosecution’s case.